The U.S. Bureau of Labor Statistics (BLS) showed employment increased by 156,000 jobs in September, a decline from August’s revised gain of 167,000 jobs. Over the past three months, job gains have averaged 192,000 per month. The unemployment rate increased from 4.9% to 5.0% in September, the highest level since April 2016. 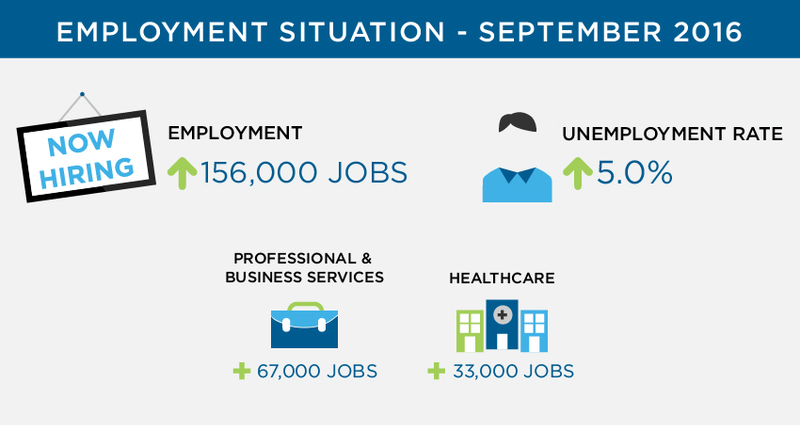 In September, professional and business services added 67,000 jobs and healthcare employment rose by 33,000 jobs. Average hourly earnings rose 6 cents to $25.79. Over the year, average hourly earnings have risen by 2.6%. Professional and business services employment rose by 67,000 jobs in September, with 16,000 of the job gains occurring in management and technical consulting services and 35,000 occurring in administrative and support services. Over the year, employment in professional and business services has risen by 582,000 jobs. Kristin Carpenter, Director of Operations in San Diego, commented on the increase, “As we approach the holiday months, as expected, our Administrative Division has seen a drastic increase in call center positions. This time of year we typically see many seasonal opportunities for customer service, however, we are finding that this year many of our clients are open to converting the top candidates in the seasonal classes to full time status after their season closes. We are encouraging our candidates to remain punctual, committed, and hard working through the holiday season so they are considered for full time opportunities. Healthcare employment added 33,000 jobs in September, with 24,000 of the job gains occurring in ambulatory healthcare services and 7,000 in hospitals. Over the year, employment in healthcare has risen by 445,000 jobs. Jason Bruckman, Vice President of Workforce Recruitment in Las Vegas, commented, “In the last month, our Healthcare Division has seen an increase in competition for Healthcare positions, especially for Medical Assistants in the market. We consistently share our supply and demand research with our clients to help them stay competitive. As a result, they can evaluate their talent acquisition process, compensation, and job requirements. To stay competitive in today’s labor market, more and more employers are having to increase hourly pay and streamline the interview process to attract the right workers among the shrinking talent pool. Employers who do not take action to remain attractive run the risk of losing existing employees and failing to secure new ones. For over 40 years, Eastridge has helped companies of all sizes maintain a fully staffed workforce while improving their talent acquisition process.